Wounds are morphological or functional disturbances of tissue integrity. 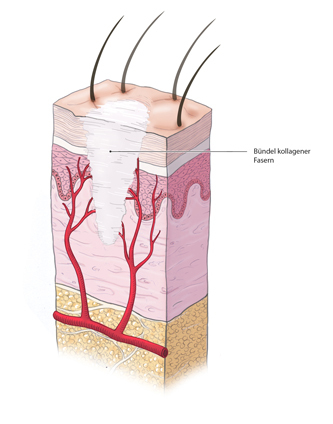 Injury of the superficial skin layer, however, is not a necessary precondition for the existence of a wound. A distinction is made between wound healing with restitutio ad integrum and wound healing with scar formation. The latter occurs when the stratum basale of the epidermis is injured. Clinically, healing “per primam intentionem” is differentiated from healing “per secundam intentionem”, also termed primary intention healing and secondary intention healing. During the granulation phase, new tissue forms in the wound bed and vascular buds sprout into the wound, giving the granulation tissue a bright red and grainy appearance. A first effective germ barrier is formed in the wound that protects against infection. 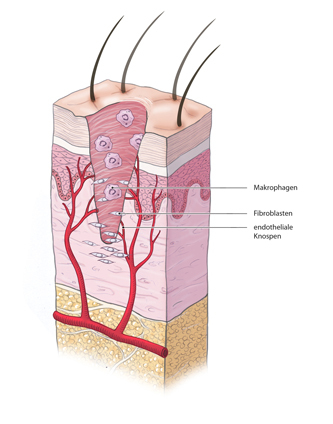 Epithelialization of the wound occurs next, keratinocytes divide and migrate into the wound bed. This process is guided by a lactate-depending chemotaxis and the O2 gradients within the wound. The process ends when the wound contracts and a network of collagen fibers forms, lending stability to the scar and reducing the wound’s surface area by up to 90%. Normal wound healing requires a wound free of infection and not subjected to mechanical stress. Wounds that are infected or subjected to continuous pressure or mechanical stress do not heal. Wounds younger than ca. 8 h can be primarily closed. The wound must be clean, unless it is a bite wound, for which open treatment is standard. After cleaning and exploration, the wound is closed with deep sutures and a monofilament thread using a simple interrupted stitch, or the vertical mattress stitch according to Donati or Allgöwer. If there is trauma to the wound margins, wound debridement should also be performed and if necessary the wound margins mobilized to ensure tension-free wound closure. This is the precondition for healing per primary intention. Open wound treatment without primary wound closure should be the goal in grossly dirty wounds as well as in bite and defect wounds. An exception to this is facial wounds, which even if dirty can be treated by primary closure due to the excellent local perfusion. In open wound treatment, the wound must always be thoroughly cleaned. All foreign bodies and dead tissue must be removed. The necrosectomy here is important, since the body’s own defense can only be effective in well-perfused tissue and dead tissue is only a breeding ground for pathogens. Dry wounds heal less well than wet because cellular processes need a moist milieu. This phenomenon is exploited in moist wound care. Excess wound secretions, however, can also hinder wound healing. Adjuvant vacuum therapy is commonly used today both to remove excess wound secretions and to promote granulation by creating negative pressure. At the same time, the vacuum sealed bandage works as a germ barrier. A wound conditioned like this can be secondarily closed or closed by a split-thickness skin graft (MESH graft). Delayed wound healing can have various causes. As a rule of thumb, any wound that has not healed after 4 weeks is a chronic wound. The possible causes are many and varied, including disturbed microcirculation, wound infection, generalized circulatory or metabolic disorders such as diabetes mellitus, chronic venous insufficiency, peripheral arterial occlusive disease, immunosuppression, or a wasting syndrome/cachexia. Foreign matter in the wound, recurrent trauma, or radiation injury can also cause a chronic wound. The top priority in chronic wound management is treatment of the underlying condition. The second priority is optimal conditioning, i.e. improving the wound milieu. 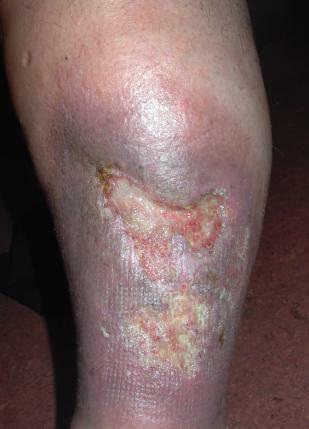 Venous leg ulcers are a type of chronic wound. Chronic venous insufficiency is often the source of this clinical picture, causing the blood to back up and pool in the vein of the leg giving rise to venous hypertension. Treatment consists of compression therapy and surgical wound debridement. Moist wound treatment should be attempted together with superficial vein reflux surgery to eliminate the underlying condition. Injury to vessels triggers the coagulation cascade. Thrombocytes are activated and aggregate. With the formation of a thrombus hemostasis is reached, the matrix for subsequent cellular immigration is formed. Degranulation of alpha granules releases growth factors. Vascular permeability increases, inflammatory cells immigrate, edema forms. Characteristic swelling and reddening occur. Immigrant granulocytes remove cell debris, the phagocytosis rate increases dramatically. Monocytes are activated and differentiate into macrophages, unlike thrombocytes they can both secrete and synthesize growth factors. T-cell lymphocytes are activated. Granulation tissue forms in the wound bed. This phase is characterized by mitotic activity. Fibroblasts make up the extracellular matrix. Collagen formation increases the wound’s tensile strength. Capillary buds sprout, vessels are formed. 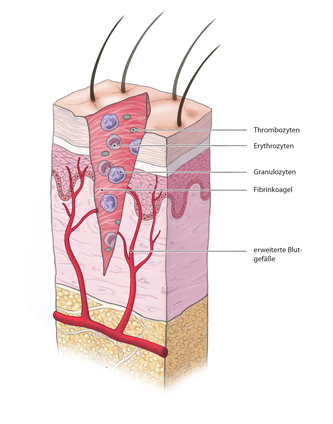 Keratinocytes migrate into the wound and initiate the repair phase. When keratinocytes encounter one another, migration is stopped and the repair phase begins. This phase is characterized by an increase in the tensile strength of the wound. Blood vessels retreat, leaving a pale, hypovascular scar. There is no perfusion deficit, polyneuropathy paralyzes the small foot muscles, little by little the transverse arch of the foot collapses. The most severe form of this clinical picture is termed Charcot foot. Microangiopathy leads to proliferation in the media (unlike in peripheral arterial occlusive disease [PAOD], where there is thickening in the intima). This can produce deceptively normal occlusion pressures in color-coded Doppler sonography, rendering this diagnostic modality of little use in the diabetic foot. Mixed types of ischemic diabetic ulcer are quite common. Treatment of ischemic diabetic ulcer consists of debridement and moist wound care. It is also important that pressure relief shoes are used to ease pressure. Treatment should aim at revascularization before major surgical measures or even amputation become necessary. The so-called IRA rule applies here: infection control, revascularization, and amputation.